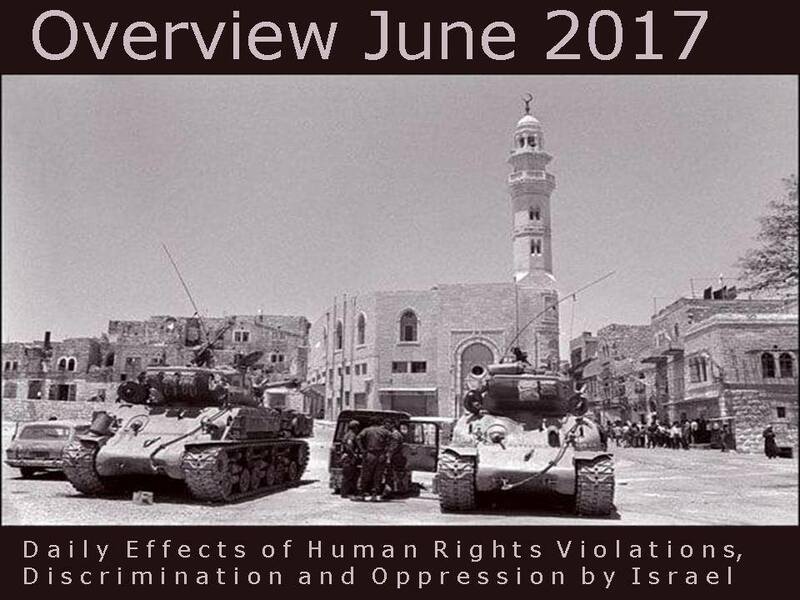 In the month of June 2017 Staat van Beleg could list 580 human rights violations (and 175 reports/analyses). (see our archive). Every month we are highlighting another aspect of the occupation of Palestine. This month we will focus on the June War of 1967. Israel took over wat was of left of Palestine, and also parts of Egypt and Syria. Some liberal defenders of Israel sometimes admit that with the occupation and settlements after 1967, Israel was not the democratic country it used to be. 50 years of occupation is of course a horrible thing to “celebrate”, and we are glad that so many people have reacted last month on what the Palestinians had to endure for too long. As we all know, the end is not in sight. For the Palestinians the occupation started much earlier. After a rigged vote at the United Nations in 1947, and a “Partition Plan” for Palestine, the Zionists wasted no time and started demolishing and taking over Palestinian villages to grab more land. And that was long before a reaction from Arab countries. But since we are commemorating how Israel took over the rest of Palestine fifty years ago, we will show how the reality was very different from the way the media presented the war. The CIA said at the time: the Egyptian forces, Syrian forces are in a defensive posture. They don’t have a chance in the world to win against Israel. If Israel is attacked, it will win in a week. If Israel attacks, it will win in a week. It doesn’t matter. It was Israel who started the offensive with the destruction of most of Egypt’s air force on the ground, although Israel tried to give the impression the Western press that they had been attacked. Israel’s victory was celebrated as a miracle. By calling it the “Six Day War” with a reference to Genesis, it gave the more extreme religious groups more power. In a couple of days, the country controlled by Israel had become four times bigger. The occupied West Bank was referred to as “Judea and Samaria”, as if it was Jewish territory. At the time there was already a lot of political support from the US. This would become clear when after three days Israel sunk the USS Liberty in international waters, killing 34 people. The affair was hushed up and until today the survivors are waiting for justice. Military support at the time came from Britain (tanks) and France (fighter jets). It was after this war that the Americans realized they could use this powerful ally in the region. Even after everything that followed, the occupation, the settlements, attacks on Lebanon and the Gaza Strip, Israel got 38 billion dollars in military support from Barak Obama. Like Laron, American scholar Norman Finkelstein is very clear about the lies Israel used to sell this war. The truth is that Nasser and the other Arab leaders had absolutely no intention of invading Israel in June 1967. And Israel’s existence was never in the slightest doubt, as both Israeli and American leaders knew that Israel could easily win any conflict, even against a coalition of Arab states. Gladly, more and more people are starting to realize that the underlying ideology – political Zionism – is at the root of the suffering of the Palestinian people. That’s an important development because it goes much further than ending the occupation. Israel has always chosen expansion over security. It’s a pattern we can follow since the end of the 19th century. A different approach to Zionism also implies that real change must come from inside. You can’t pretend to be a democracy after European model when only Jews are considered worthy citizens. You can’t brag about your technology and modern society when powerful groups of fundamentalist Jews want to back – litteraly – to the situation of 2000 years ago. If ‘centrist-liberal’ MK Yair Lapid can say “Maximum Jews on maximum land with maximum security and with minimum Palestinians”, than even if Israel would accept internationally recognized borders, no county would be happy to be their neighbour. This colonial project following ethno-religious lines will get more and more internal problems if the outside threat is not there to start a war every now and then, so the population will have other things to worry about. … when we look at the 1967 occupation, we are looking at only a part of the picture. And we need to ‘finish the job’ conceptually – to see that it’s part of a greater paradigm, which is settler-colonialist, and is inherently genocidal. Incrementally so. As Ehrenreich puts it: “The question about genocide– yes, it’s an incremental genocide. And I think that’s a word that gives a lot of people pause and it certainly should”. The first casualty of war is the truth, as the saying goes. No propaganda without language. The oppressor uses concepts that are more applicable to the oppressed. Israel is always “the victim”. Every Palestinian is a “terrorist”. Every child that throws a stone is a “danger” to the nuclear superpower. The sheer presence of Palestinians is an “existential threat” since they could undermine the “Jewish charachter” of the state.The Gaza Strip is not “occupied”, although is sealed on land, at sea, and in the air. And although Israel has no official borders, every expansion seems to create more “infefensible borders”. The use of the term “unauthorized outposts” makes Israelis believe that there is a difference between a “settlement,” allegedly an authorized, legal entity, versus an outpost, an entity allegedly established legally but without official permission from Israeli authorities. This is how the government can claim that it does not build new settlements and at the same time turn a blind eye to the establishment of new outposts and offer them funding. Israel prides itself on being both Jewish and democratic, but more Arabs than Jews live between the Jordan River and the Mediterranean Sea — in other words, in the areas under complete Israeli control (inside the Green Line, the West Bank, the Golan Heights and East Jerusalem) or partial control (the Gaza Strip). It’s easy to make Eldar’s list much longer. The names of military operations, for example, often have both a biblical and offensive tone in Hebrew, but a more secular and defensive tone in English. The massacre in the Gaza Strip of 2014 was called “Mighty Cliff“, but became “Protective Edge” for most of the Western world. Again, language is used to change the aggressor into the victim. And here we end our short overview. Many articles have been written last month, and later this year – 100 years after the Balfour Declaration – there will again be a lot of attention for the reasons behind the Zionist’s settler-colonialism. 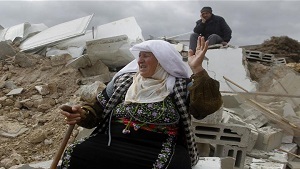 But this does not mean that Israel will admit that the situation is intolerable. The country is denying access to everyone in favour of a boycott of Israeli products, and recently a law passed that will make it possible to close down websites critical of the occupation or Zionism. About the only positive development is that among young Jews in the United States, support for the Jewish State is not as strong as it used to be. The more people learn about what is really going on, the less they feel the need to defend it. If that is a general trend, then a change in public opinion should lead to a change in policy sooner or later. That’s all we can hope for at the moment. Staat van Beleg compiled a list of interesting articles that appeared last month about different aspects of the June War and the following occupation.